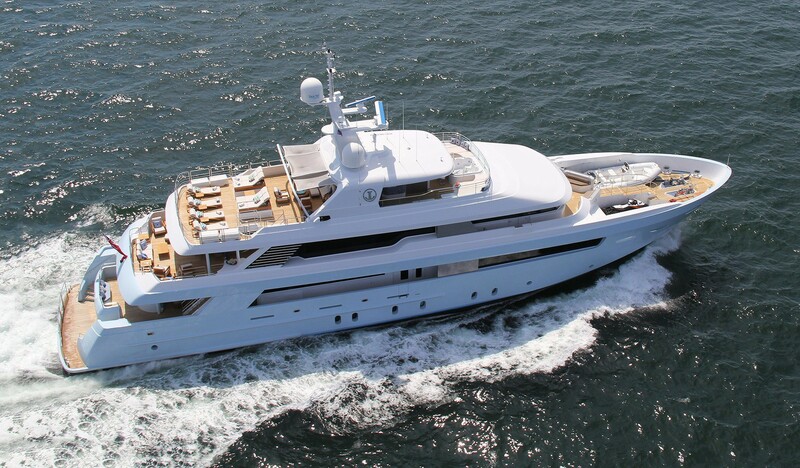 The 46m/151ft CUSTOM SUPERYACHT from Delta marine was built in 2011 and last refitted in 2016. Constructed with a GRP hull and superstructure, this semi-displacement motor yacht has naval architecture and interiors from Jonathan Quinn Barnett and Pembroke & Ives. The accommodation sleeps a maximum of 10 guests across five cabins. The lower deck stern has a broad swim platform with a ladder for easy access in and out of the water. Stairs connect up to the main deck aft where a sofa is placed in the sunshine along the stern and a larger casual lounge setting is placed beneath the shade of the upper deck overhang. A drinks cabinet and widescreen TV are placed on the port side to enhance outdoor relaxation at any time of the day. The stately alfresco dining setting is located on the upper deck aft and On the upper deck aft and up to 10 guests can enjoy a midday meal in the shade before unwinding on the stern sofas under the sun umbrellas. On the sundeck, the aft is laid out with sun pads and a casual seating area for guests, which under the hardtop there is a large alfresco lounge with a forward bar complete with widescreen TV. Guests can unwind in style on the sundeck forward, where a raised Jacuzzi sits between two spongy sun pads to take in the forward views, and a widescreen TV is placed on the wall behind so that guests can soak and recover from a busy day while watching a film after dark. The lower deck contains the tender garage and engine room to the aft, placing the guest accommodation amidships. Here, there are two spacious VIP staterooms, a double cabin and a twin cabin, all with en-suite facilities. The crew accommodation and facilities are placed within the bow. On the main deck, the full-beam Master suite is placed forward and provides guests with an L-shaped sofa beside the windows, and a widescreen TV opposite the bed. Behind, the main salon and formal dining area share the same room, where dark wooden panelling complements the white walls. Up to 10 guests can enjoy neo-classical comfort while dining, then after settling into the symmetrical lounge where there are a plush sofa, two armchairs and a coffee table along each wall. The expansive sky lounge has everything the group needs for an evening of sophisticated entertainment: A grand piano sits opposite the port-side bar, which has a widescreen TV and a comprehensive selection of spirits to suit any occasion. An L-shaped sofa and three armchairs form the sitting area around a drinks table, and close to the aft sliding doors a games table completed the sky lounge entertainment. 2 x Caterpillar 3512B engines each producing 2250 HP allow for a top speed of 17 knots, a cruising speed of 12 knots and a range of 3,000 nautical miles. YACHT ACCOMMODATION The accommodation sleeps a maximum of 10 guests over 5 cabins: 1 Master suite, 2 VIP staterooms, 1 double cabin and 1 twin cabin, all with en-suite facilities. The professional crew of 9 will provide stellar service throughout the cruise. 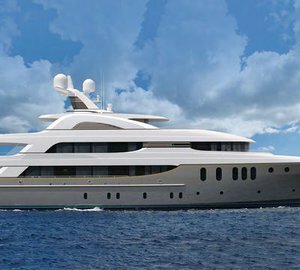 We do have available further amenity, owner and price information for the 46.05m (151' 1") yacht 46M CUSTOM SUPERYACHT, so please enquire for more information.